About a year ago, Wally West and his twins felt something calling them to Gotham. They arrive there just in time for the dome to appear stranding them from Linda and taking away their powers. A year later, Wally has been spending his time trying to break free. Once the dome falls, Flash is supposed to fight Flashpoint Wonder Woman, but he decides to break the rules and races off to try and help other cities that were taken here by Telos. He ends up in El Inferno, which has already fallen. Telos warns Flash if he refuses to fight, his family will fall too. Flash races through the various cities trying to find his way back to Gotham. He encounters Fastback, a speedster turtle from Captain Carrot's world. Fastback proposes all the speedsters team up, but they are interrupted by the arrival of Wonder Woman and an army of Amazons. This issue was a great way to give quick glimpses at the various cities Telos has taken. Anyone reading Convergence needs to read this issue, it definitely gives the clearest explanation of everything that is going on here. I also thought the relationship between Wally and the twins was real well done here. My only gripe with this issue is that it seemed to have a strange continuity glitch. The narration at the end says Jai lost his powers and Iris had become Impulse...but neither of those things happened here. They both have powers and generic costumes, no heroic identities. Superman has been stranded in Gotham and powerless for the last year. He has been sneaking around as a vigilante in costume anyway. His powers return when Telos drops the dome. We find out that Lois, Clark, and Jimmy were all conveniently at a new convention which is how they got stranded in Gotham. During this time, Lois got pregnant with the baby due any minute now. Superman goes to check out the other cities, and Flashpoint Batman sets up an ambush for him. Captain Thunder, Cyborg, and Abin Sur attack him. Superman tries to reason with them, and at first they are inclined to listen...until Jimmy Olsen arrives guns a blazing. 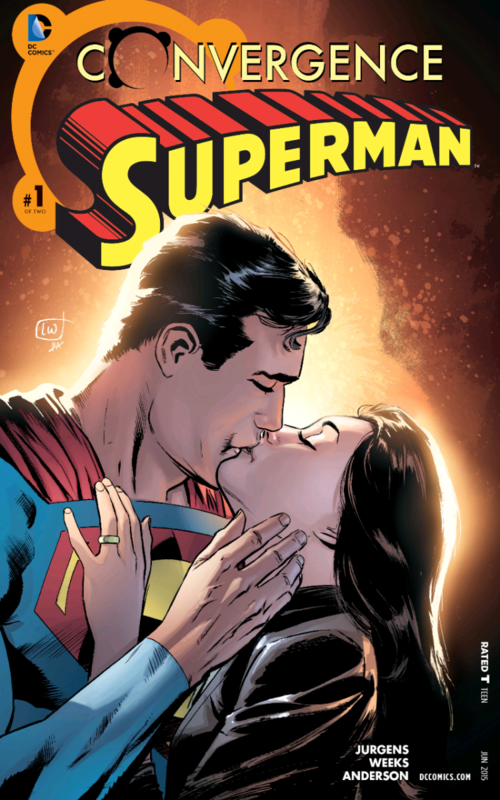 They start to give Superman a beat down, and Flashpoint Superman goes looking for Lois. There was a lot to process in this one. I especially liked Flashpoint Batman realizing that in Superman's world, Bruce was still alive, and Flashpoint Superman desperately wanting to see that world's Lois. Who knew hot headed Jimmy Olsen could cause so much trouble. Jurgens has always been my favorite Superman writer, and this was just a great comic. The Atom (Ray Palmer) seems to have managed to keep some of his powers under the dome...but that just manifests in the ability to make one of his hands really big. I guess he's been reading Ms Marvel, as Kamala seems to love that move. Palmer also seems to be losing his mind, hearing voices...especially Ryan Choi, his predecessor who was killed by Deathstroke. Palmer wants revenge, but Deathstroke ends up coming for him instead. Before Palmer can get his revenge, he's yanked away by Telos and forced to fight Barracuda from the Extremists. During the fight, Ryan seems to return to life. 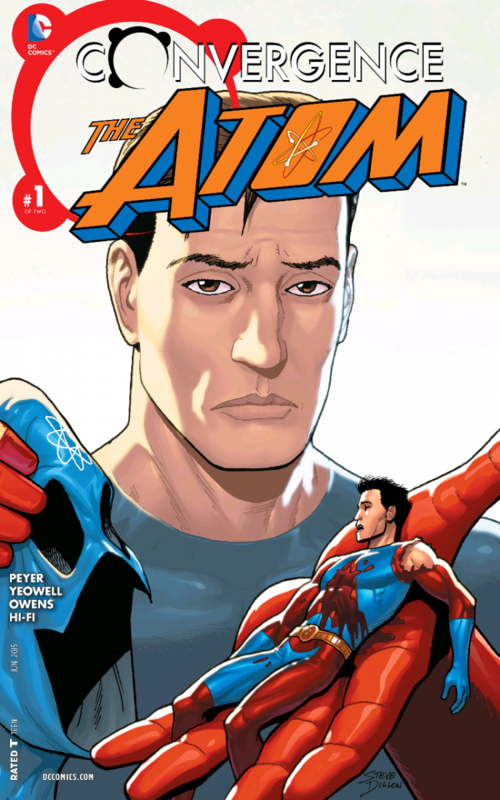 This was kind of a fun story, but I've never been an Atom fan, outside of the version of Arrow. This was probably the week 1 title I had the least amount of interest in, and nothing here changed my mind. It wasn't particularly bad in any way, just nothing all that memorable. Greg Rucka doing a Gotham story? Pretty much an instant win for me! 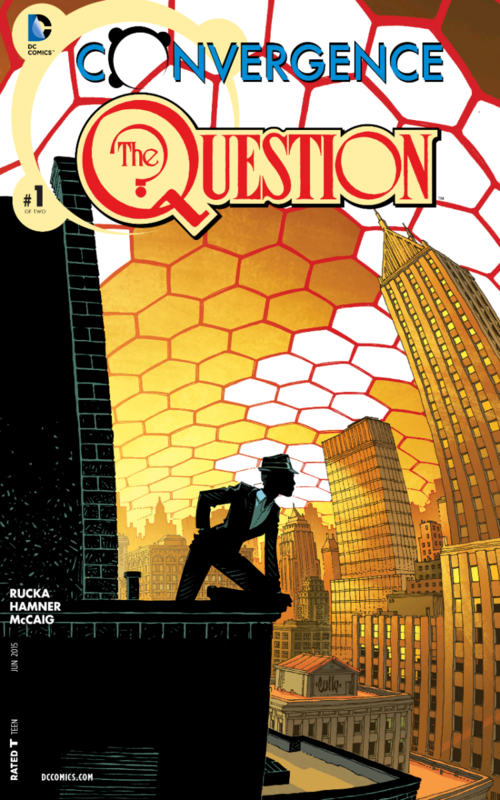 Renee Montoya has taken on the mantle of The Question. She is working with Two-Face to find medicine to help the people of Gotham, including her own dying father. Montoya has been rooming with Huntress, who warns her how dangerous Two-Face is. When the dome drops, Two-Face becomes obsessed with killing an alternate reality version of himself to balance the scales, but Montoya tries to stop him. He knocks her out. She wakes up to find Batwoman standing over her. It was pretty cool that this issue compares the events of Convergence to No Man's Land. You would think more people in Gotham pre-New 52 would have made that comparison, but this was the first place I've seen it. The relationship between Two-Face and Question (in and out of costume) was really well done, and definitely helped elevate this book to me. This book also seemed to not involve any other DC reality, but still made real good use of the dome. A great issue, but with Rucka and Hamner, it really could not have been bad. Roy Harper's life kind of sucked before Flashpoint. His daughter had been killed, and he's basically turned his back on being a hero. When the dome appeared, it gave him a chance for a fresh start. He's turned his life around, becoming a friend and hero to the kids of Gotham who are obsessed with his cybernetic arm. But, his happiness is shattered when the dome drops. 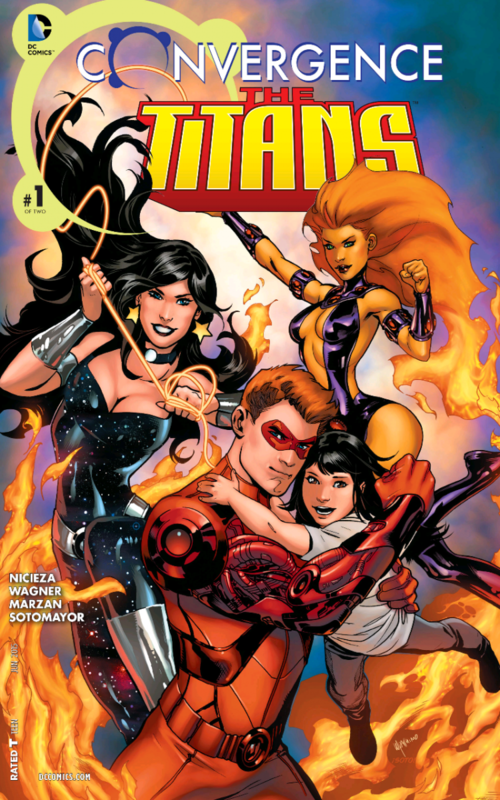 Donna Troy and Starfire were also there, and when their powers return, they are tasked with fighting the Extremists. Roy Harper has to join them. One of the Extremists offers to bring his daughter back to life if he betrays his friends. The issue ends with Ray shooting them. There was a lot of great Roy Harper moments in this issue. I missed Pre-52 Roy, even if DC had made his life into a series of unfortunate events. This could have been a great issue, but it did tend to meander a bit, and I thought it was odd that the two Titans powerhouses needed to be saved by Roy. Kori and Donna did just about nothing in this issue. While I did think the main series has been kind of a drag, the tie-ins have been good for the most part. I do think they can do a better job setting things up for potential new readers, though. I also would have liked to see more universes represented. I had commented yesterday that it felt like Pre-New 52 Gotham was in a bracket with a few other universes. But really, we didn't see much of even those few other universes. Maybe we will see more in the second issue of these series. Next week, we see DC cities set from just before Zero Hour, including the return of Steel, Matrix Supergirl, Azbats, Superboy, and other characters I loved in the 90's. Kind of bummed we don't get Starman, but you can't have everything. I'll be back next week for more reports from the Front Lines!